This stylish kettle is all about precision, making it the perfect vessel to make consistently excellent filter coffee. The gooseneck spout allows for ultimate control over pouring direction and speed, also the unique shape of the spout tip helps to prevent those messy and annoying drips many kettles encounter. 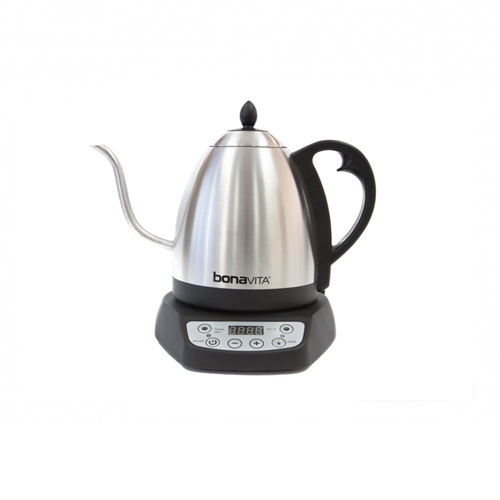 The temperature control is another thing that makes this kettle in a league of its own, it can be set +- 1 degree, can be displayed in Celsius or Fahrenheit, a variety of different temperature settings can be stored for future use and finally a constant temperature can be maintained for up to an hour. Price includes GST and delivery.